This weekend in Paris—well, just outside the city, in the northern suburb of La Courneuve—is an annual event that many dub the French version of Woodstock due to its focus on music, humanism and activism. 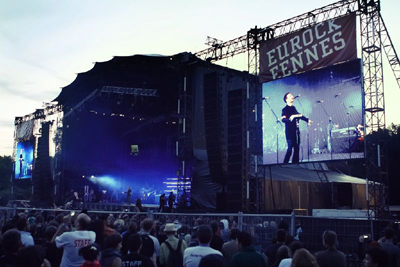 Called Fete de l’Humanite (Festival of Humanity), the three-day gathering, which began Friday, is known mostly for its series of folk, rock and pop music performances, and it is true that for many attendees the event is all about the music. Past performers include Pink Floyd, The Who, Deep Purple, Genesis, The Kinks, Deep Purple, Madness, Simple Minds, Joan Baez and Avril Lavigne. This year’s music will be provided by the Scorpions, Massive Attack, IAM, Bernard Lavilliers and more than 30 other artists. But the festival also is distinctly political in nature, focusing on humanitarianism and philanthropy with a decidedly Left-leaning point of view. 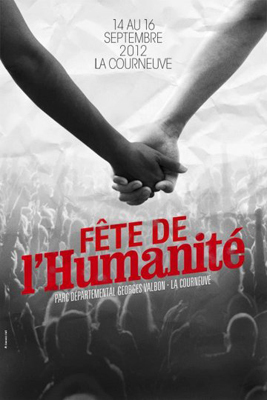 Indeed, the first Fete de l’Humanite was sponsored in 1930 by the French Communist Party newspaper L’Humanite as a way to raise money to support the publication. 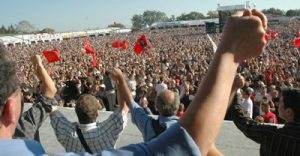 Over the decades, the annual September gathering has grown to include music, political debates, candidate presentations, calls to action, political organizing seminars and much more aimed at advancing the broader goals of humanism and equality—and not a communist doctrine—both in France and around the world. To further that goal, hundreds of French and international organizations will have information booths scattered around La Courneuve’s massive Parc Georges Villon, where the event is held, to encourage attendees to fight for global lilberte, egalite and fraternite (freedom, equality and brotherhood), the words of France’s national motto. Among the seminars, panel discussions, presentations and debates scheduled for the 2014 Fete include “Struggles and Stories of Women,” “Sustainable Energy for Sustainable Human Development,” “A Planet to Feed,” “The Future of Nuclear Power,” “The Fight for Digital Freedom” and nearly 75 other events. The first Fete de l’Humanite (called fondly Fete de l’Huma by the French) drew about 1,000 guests; last year’s event attracted more than 600,000, and similarly large crowds are expected again at this year’s event. One of the reasons for soaring attendance, besides the event’s palpable bohemian vibe, is that ticket prices are an extremely affordable 30 euros for the entire weekend, a policy put in place by organizers to allow accessibility for all interested attendees, regardless of financial resources. If you’re in Paris this weekend and you’re interested in seeing how France’s Left-leaning political, social and cultural organizations operate—and, of course, to enjoy some fantastic live music—get online right away to get your tickets. And be sure to let us know all about your experiences! 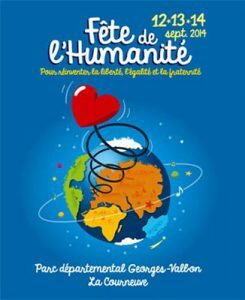 This entry was posted in Annual Events, French culture and tagged Fete de l'Humanite, La Courneuve, Left-wing politics, live music, Parc Georges Villon by Bob Adams. Bookmark the permalink.